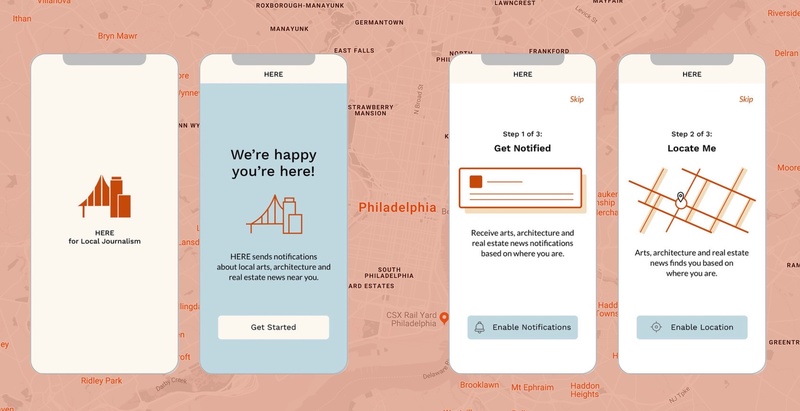 By Sarah Schmalbach April 2, 2019, 9:45 a.m.
Our way of exploring the issue was to test an app that sends people local news stories about where they actually are. 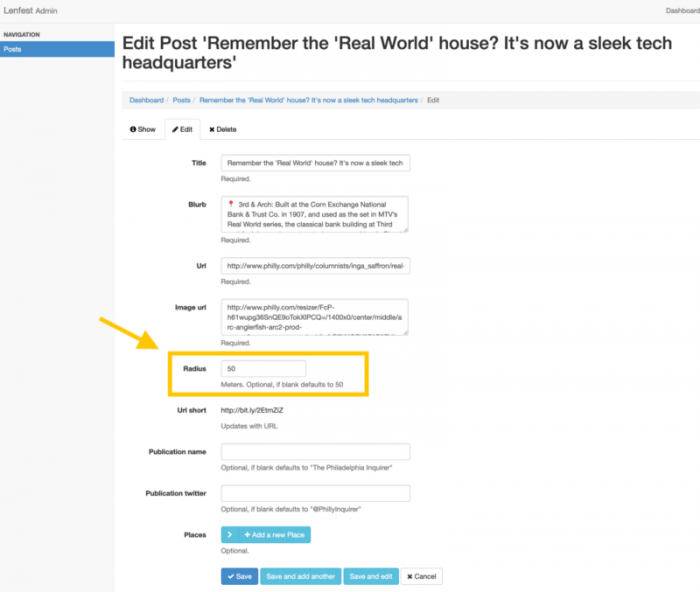 Unlike national or international newsrooms that are incentivized to send or organize stories by continent, country, state, or city — local newsrooms can organize stories about neighborhoods, wards, counties, and towns. They write about block-level issues, and if technology lets us deliver stories by block now, the chances that a nearby local story will be relevant to someone increases significantly. The Content: Evergreen stories about art, architecture, and real estate and from The Philadelphia Inquirer. The Numbers: 350-plus people have installed the app and 100-plus have received notifications. Not everyone has received notifications because of the number of stories (about 60), the urban concentration, and because we skip notifications when people are driving. Of the people who did receive notifications, 40 percent engaged with them. The Lessons: We saw early signs that location-aware story notifications about topics people are interested in may be up to 4× more engaging than regular news alerts (the sample size is small, and the insights are directional), but we also learned that people may not want to stop to read an entire article while out walking. We learned that new newsroom roles and tools would be needed to support these products at scale, including better location databases, editors for “places” and a revamped CMS — but that the opportunity to connect with local readers at important moments could be big. Last, location-aware products have the opportunity to leverage or maintain trust with readers and can create more value from lots of local evergreen content. The Future: We’ll continue our exploration of the link between location and new local news products by making local professional restaurant reviews easier to search, browse, and save based on location. If you’re interested in exploring new products for local food content, let us know and we’ll send you a preview of our research and designs before we launch the experimental app next month. We had Inga Saffron’s architecture coverage in mind. Inga is a Pulitzer Prize-winning journalist who has covered the region’s architecture, planning, and development for nearly two decades. Her coverage was a good starting point because her stories tend to be relevant for a long time, and we liked the idea that something other than the endless news cycle would drive people to use the app. Instead, their actual pathways through the city would set off news notifications about where they were, block by block. This wasn’t going to be a news walking tour — it was going to be a news tour of where they were walking. So now we had an even bigger pool of high-quality evergreen local stories to pull into the app. They wouldn’t need frequent editing or updating, and the stories were tied to a single place, which made geotagging and testing relatively easy. We also thought sending people notifications about buildings they could look up and see would make the notifications easier to understand. In the future, we could imagine this method working well to surface other types of local news stories, including important local coverage about school safety — like the Inquirer’s Toxic City investigative report, paired with a full safety report for the school nearest to you. We could also imagine notifying people about an Inquirer business story about a popular hoagie debut. (Yup, we call them hoagies here.) The same goes for a story about a new musical for children opening at a local theater. Parents walking by the Arden Theatre in Old City might want that story to find them, rather than the other way around. …geotagging every local news story and notifying people wherever they go is a big, sprawling, and possibly chaotic idea. That’s why we’re starting small and measuring outcomes first before potentially expanding the concept. LOVE Park was supposed to be the People’s Park. How did it end up as a granite Sahara? He taught himself how to draw in prison. Now he’s winning over the art world. All of these stories are clustered geographically around Love Park, a public plaza adjacent to City Hall. The stories are about a mix of topics, including a critique of the park’s recent overhaul, a story about the renovation of a former bank building, and a profile of a local muralist. You can read more about the thinking behind the app in our intro post and get a peek into our research and design process here. All of what we did and learned is below, which begins to answer two key questions: Do people want to receive local news about the places they actually are? And should newsrooms invest in the resources and tools to deliver it this way? Since this was just an experiment, promotion was light. The Inquirer published an article on Philly.com about the app and it was tweeted it out to a few groups we thought would be interested in trying it out, including Philly.com readers (Philly.com is The Philadelphia Inquirer’s website), Inga Saffron’s followers (her journalism provides the foundation for the app) and followers of the Lenfest Lab. Philly.com: “Help us test a new way to read and learn about Philly”. The number of stories. There are only about 60 stories in the app, which limits the opportunities people have to walk by a place a story has been written about. We can add more, and we will, but it’s currently a manual process handled by the lab. The implementation of motion detection. Anyone who isn’t walking won’t get a notification. So far, more than 1,000 notifications have been sent — but nearly 6,000 have been skipped because people were driving, riding public transportation, or otherwise moving too fast to receive one. The urban concentration of stories. 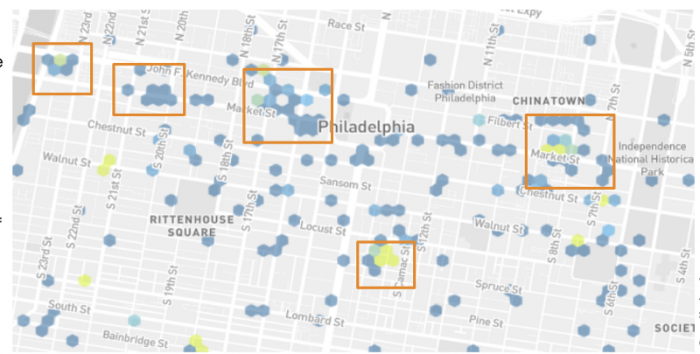 We selected stories located in Center City because there was a lot to choose from, and we also knew chances would be higher that people there would be walking instead of driving. However, that means suburban app users can only receive notifications when they come into the city and walk around. Early signs show that location-aware notifications about a topic people find interesting can be up to 4× more engaging. 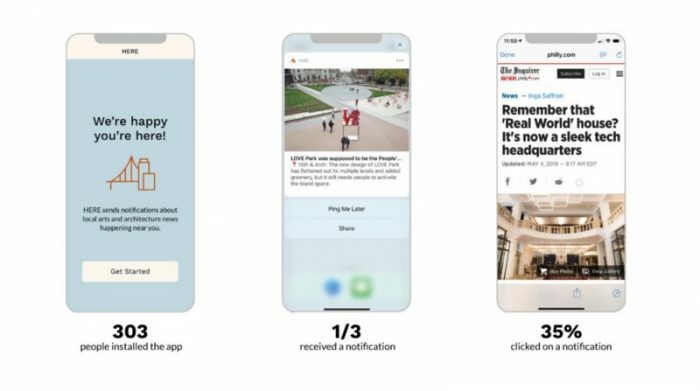 The engagement rate for HERE app notifications peaked at 14 percent; an average news alert gets a 3.4 percent engagement rate. This starts to show us that paying attention to where people are and what they’re interested in can pay off when it comes to engagement. The most common news alert — breaking news — definitely appeals to a lot of readers and can drive immediate traffic, but curated alerts for people based on what they like reading about where they have the potential to drive even more meaningful experiences with local news coverage. 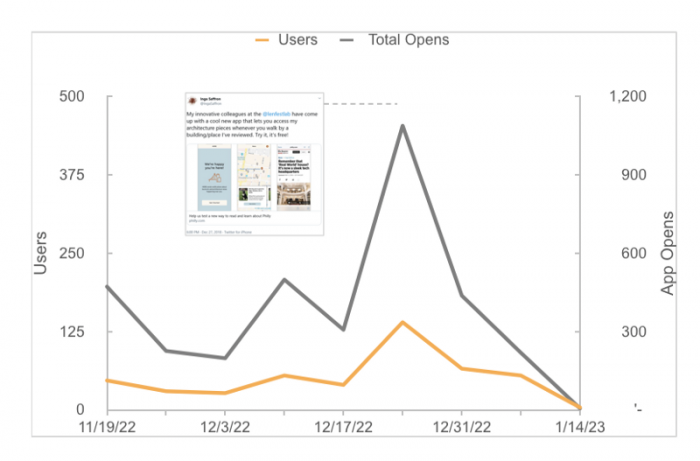 The data is directional given the size of the group, but it still shows a 4× increase in engagement over less customized, less location-aware notifications. If newsrooms applied this approach to more local stories, audiences might start relying on them to get trustworthy information about what’s going on around them in real time. Location-aware alerts seem to be more engaging on weekends. The engagement rate for notifications was 10 percent on weekdays and 14 percent on weekends, with most clicks coming on Sundays. Proof that people have more time to read news on weekends isn’t a new insight, but it’s a useful reminder that even though technology allows us to reach people wherever they are, whenever they’re there — newsrooms should still think critically about the weekday vs. weekend habits of their audiences and build new location-based products that are adaptable for different contexts. Location-aware alerts offer a new way for stories to find their audience (instead of the other way around). At the same time, it would take resources to get it right. 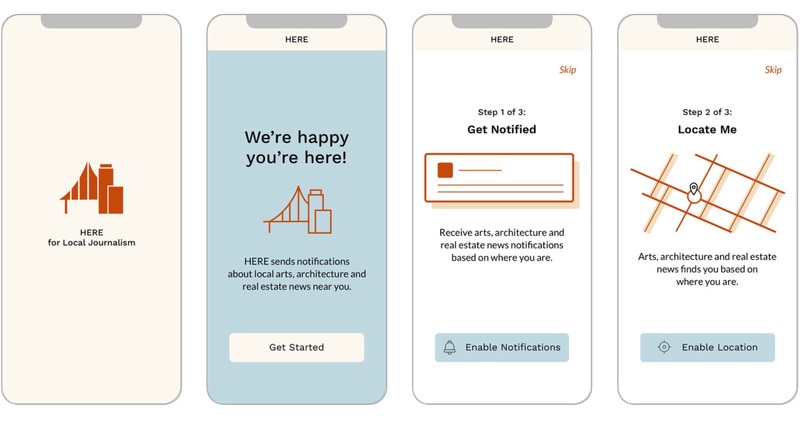 We saw that if location-aware notifications were sent for many more stories, an organization would probably need to see enough value in it to assign dedicated editorial resources. Editors would determine whether a reader’s proximity to a story location actually meant it’s more relevant to them. An example would be this story in the app about a grocery store opening. Location-aware products let you build or maintain trust with an audience. We were glad to see hundreds of people install the app and also give it permission to access their location and motion. We attribute much of this behavior to the trust people already had in Inga Saffron and the Inquirer and was supported by the transparent language written into our welcome screens. 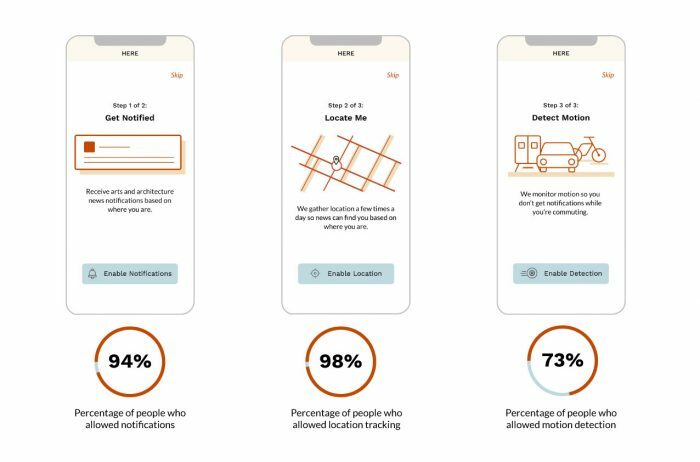 We were thoughtful about the clarity and accuracy of words we used to explain the experience to people, and we were happy to see that 94 percent of people let the app send notifications; 98% allowed it to access their location and 73 percent of people let the app detect whether or not they were driving. Location-aware products can give journalists more promotional power, and power to start and own conversations about new ideas. “On the Block Alerts”-I love it! What a great initiative to inform residents and tourists alike about Philly’s built environment. Doubles as a tool to endear passers-by to the idiosyncrasies of the city, and thus feel more connected to it. Location-aware products help you imagine content management systems of the future. This app inspired the creation of a new CMS field: radius. We used a story’s radius to set the geofence for its notification. (For more on how the CMS was built and instructions for using it yourself, read this.) Setting the radius field each time let us decide how close someone should be to receive a story notification. For example, we set the radius wider to 300 meters for this story about Amtrak’s decision to replace the iconic “clickety-clack” flipboard at Philadelphia’s 30th Street Station. We had ongoing conversations in the lab about how we might apply different user experience rules if people were in the city, the suburbs or in a rural area. In the city, you might want to send a notification to someone who comes within 100 yards of a story location, but in the suburbs, you might want to send a notification to people driving within five miles of this Baptist compound in King of Prussia, Pennsylvania. Evergreen stories are great to experiment with if you want to observe behavior over time, across seasons, etc. Location-aware products help organizations understand the importance of building and maintaining a locations database. With this experiment, we just scratched the surface of how newsrooms might organize a locations database to accelerate location-based product development. For local architecture content, tagging a single location was relatively easy — but for less straightforward stories there may be many locations associated with the narrative or none at all. All of those decisions would need to be carefully considered by experienced editors and reporters and data would need to be stored in a useable way. Knowing where people are can give hints about where to possibly direct local coverage. 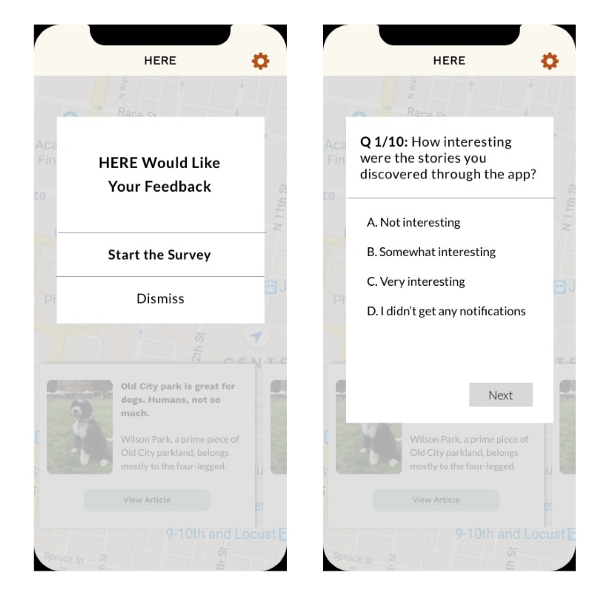 Two options for an in-app user feedback survey by Faye Teng. Further optimize content for being on-the-go: Some qualitative feedback we received internally was about the tension between walking by a building and stopping to read an article. Next time we’re going to explore new content formats that are easier for reading on-the-go like shorter pieces, highlights or audio. Consider sending an email instead of an alert: To additionally ease friction between walking and reading news, we’re thinking we might email stories to people about places they’ve been nearby so they can read them later when they have time. Think about the representativeness of our results: Many local news organizations today are focusing their efforts on big strategic wins. Meanwhile, the insights from our smaller experiments can leave organizations wanting more confidence that the results would scale to a larger audience. As a result, we’ll be taking a closer look at the sample size of our experiments and do our best to make sure they’re as representative of broader audiences as possible. Analyze potential business models and let the way people use the product direct the conversation around revenue: One reason to run experiments is to quickly discover new products that audiences truly value before building them at scale, which is sometimes called finding a product-market fit before figuring out how to make money. The experiments we run in the lab are intended to find local news product-market fit, which means we’re testing the value of a business model before moving onto the revenue model. One of the lessons that the Times learned, and I certainly learned with NYT Now, was that we tried to solve product-market fit and monetization at the same time. The most important thing is that we create something that people love, and then we can get to a scale that would be meaningful enough to make the investment you need to be able to do monetization right. A version of this piece appeared on Medium. The Lenfest Local Lab, a small, multidisciplinary product and user experience innovation team located in Philadelphia, is supported by the Lenfest Institute for Journalism and led by the author, Sarah Schmalbach. Here’s her analysis of an earlier experiment. POSTED April 2, 2019, 9:45 a.m.
Schmalbach, Sarah. "Taking local news to the really local level: Using location data to deliver relevant local news." Nieman Journalism Lab. Nieman Foundation for Journalism at Harvard, 2 Apr. 2019. Web. 24 Apr. 2019. Schmalbach, Sarah. "Taking local news to the really local level: Using location data to deliver relevant local news." Nieman Journalism Lab. Last modified April 2, 2019. Accessed April 24, 2019. https://www.niemanlab.org/2019/04/taking-local-news-to-the-really-local-level-using-location-data-to-deliver-relevant-local-news/.